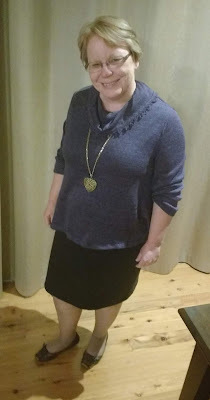 My blogging of this new wardrobe will not be in the same order as the sewing, but I will try and show as many of the pieces I make in different combinations. 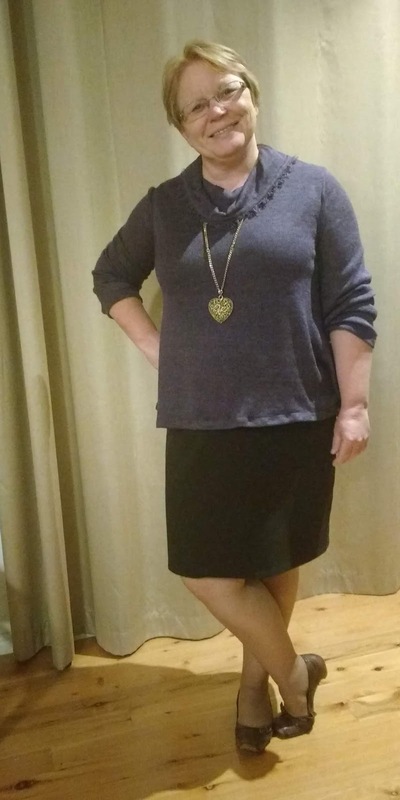 I am back today to show again the first piece I made, which was the Stylearc Cleo dress in combination with a more wintery top. 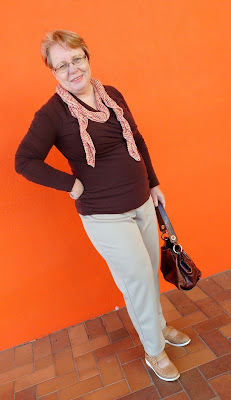 I spotted Kwik Sew 4220 pattern while I was browsing the Knitwit on-line store and really liked all the pieces in it. One of the main pieces I liked in it was the ponte pants. I have been trying to buy some but either the colour was not what I was after or the style was too narrow legged for me. Most at the moment in the shops seem to be more like leggings in styling and when you have wide, short legs I don't think it is the best look and not what I am after right now. So I figured the pattern would be a good one to have. This was my first iteration of the pants in a Spotties ponte. The top is a Burdastyle pattern - blogged here. While I was at Spotlight buying the pattern, I came across some fabrics that I decided would be good to try the pattern out. The stone coloured ponte above and an eggplant coloured rayon knit. It is a lovely colour, but the knit is very loose so needs something under it for modesty and warmth. This light weight fabric is actually quite warm when layered. I can imagine wearing it over a long sleeve when it is really cold. 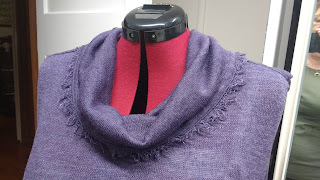 I adored the feathery fringe on the selvage and decided to use it in the top so I added it to the edge of the cowl collar. This is the fun part of making your own clothes. 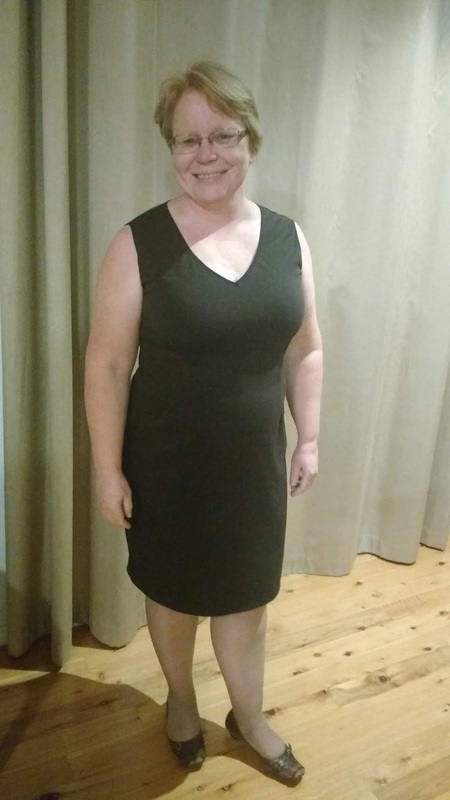 I wanted to show you the Cleo dress without a topper, so actually remembered to get a photo this time! I really like this pattern and can see myself making many more iterations. 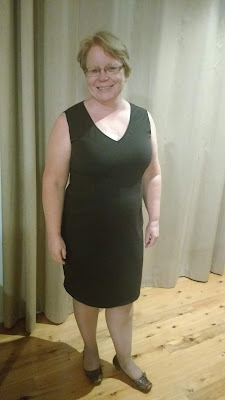 I think a sleeved one and maybe make the front v-neckline more of a curve may be the next one I want to make. A see a bit of my Grandma in me in that photo and that does make me smile. A Finn truly in build I think! I love my new purple top and have plans for a second one which in a different fabric will look quite different I think. Well Ciao for now kittens, heaps more pieces to come yet! A Winter Resort wardrobe is a terrific idea to update your wardrobe. I love your purple top, the colour is great on you, and you look very put together wearing it over the smart Cleo dress. Love the fringe for the collar!